Officiating sports at the youth or high school levels provides a terrific outlet for women and men who care about scholastic sports but may not have the time to devote to a full-time coaching position. While the job can be rewarding and even provide a nice extra bit of income, it takes a special person to excel in these positions. Officials must make quick decisions, resolve conflicts, and handle pressure. As more scholastic sports are offered and more players participate, there will continue to be a need for officials. It is estimated that 300,000 men and women officiate in the United States. Officiating can also become a career if you succeed at the youth level and graduate to calling collegiate and professional games, or it can be a great "side job" that keeps you connected with sports until you are ready to pursue a career elsewhere in the industry. Any player or coach who has put time and effort into a sport appreciates the same type of effort from the officials, umpires, judges, or stewards who oversee the games. 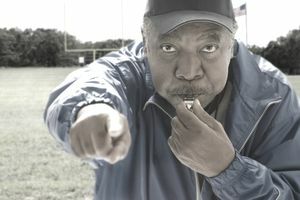 High school officials are expected to maintain strong character and unquestionable integrity. In working with young people, officials are expected to contribute to the development and educational experience of the competitors. Typically applicants attend classes offered by the high school association or an officials association to get started. New officials usually work lower level games, perhaps middle school or freshman games as opposed to varsity, as they work their way up and gain experience. Some high school officials eventually begin working college games. Not every official has played the sport they work, but they do put in the effort to understand the rules and how to apply them within the flow of the game. Officials typically work as independent contractors. Pay varies based on the sport and the level but it typically is on a per-game basis in the ballpark of $40 to $150 a game. Pay also can go up for postseason games, opportunities that typically are awarded to top officials. Sports officials are placed in highly charged situations. They need to keep their cool, even if others around them lose perspective and control. It takes a time commitment to become a top official. There is more involved than reading a rule book. Top officials attend meetings, stay updated on changes in the sport, and attend clinics to improve. Through it all, officials are able to have fun doing their job, confident that they have put in the time to give their best effort. If you start as a youth official and love the role, your goal may become to rise through the various levels until you reach the professional level. Salaries at this level are lucrative. For example, Major League Baseball umpires work in a unionized environment with salaries starting at $120,000 per year and topping out at $350,000 per year. NBA officials' salaries reportedly range from $200,00 to 500,000 per year. There are few of these positions available each year. While the job is glamorous and high profile, the travel demands and long hours represent a different lifestyle than officiating in a localized area.